You would be hard pressed to find a true Canadian that doesn’t enjoy a good poutine from time to time, and Halifax definitely has its fair share of restaurants offering up their take on the dish. However, there is only one place in town that decided to create their own spin on the popular meal for this year’s Sausage Fest. Just off of Spring Garden Road (on Brenton Street) PRIMAL came up with a delicious, sausage-inspired, poutine that pleased all of my tastebuds! Sitting on a bed of fries, you’ll find a tasty combination of cheese curds, double smoked bacon, a big ol’ sausage, and a couple of crispy onion rings for good measure. Smother all this in a savoury jus and you have the makings of an out of this world dish! 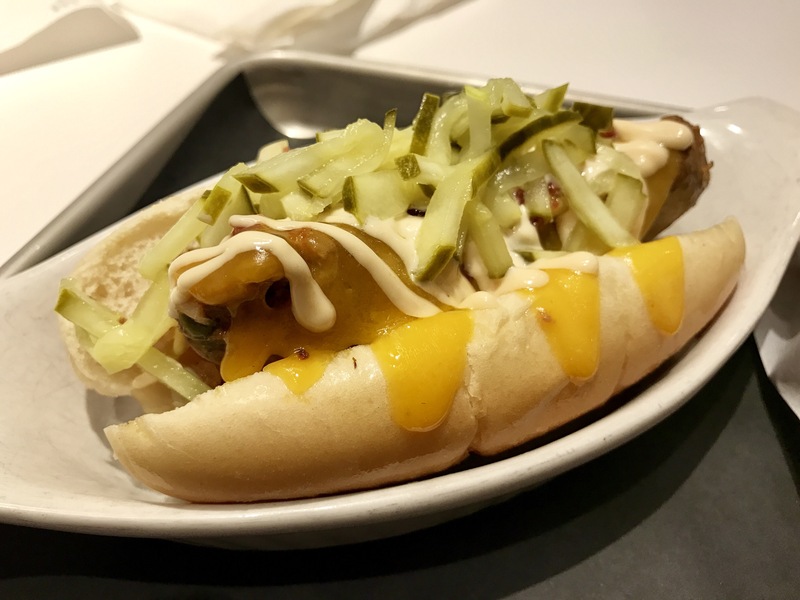 Relish is a place that likes to get creative with what it puts between two pieces of bread, and for Sausage Fest it’s no different. For this years event, they decided to do their take on the classic Sloppy Joe, but they definitely kicked it up a notch by substituting the usual beef with sausage and piling on a generous helping of tasty slaw. They do keep some elements of a classic Sloppy Joe, mainly with the sauce, and it’s very reminiscent of ones your mom would make. This Joe is definitely sloppy, but it was worth every single messy minute! Serving up a variety of beer and food, the Stubborn Goat Beer Garden is new to the Halifax waterfront this year and it seems to be a pretty popular spot for locals and tourists alike. I’ve had the opportunity to visit the Beer Garden a couple times this summer, and I was glad I got to stop in and try their Sausage Fest creation. I will say that when I heard their dish was titled ‘The Corn Dog’ I was expecting something completely different than what I actually received. That being said, I was not disappointed by any means! This dog was packed full of delicious toppings, so much so that I had to resort to a fork and knife to eat it. Some note-worthy elements to this dish were the crunchy tortilla chips and the queso fresco. My favourite part though had to be the amazing double-smoked bacon-wrapped knackwurst, which blew me away with its great flavours! All around a great dog to enjoy on the waterfront with a cold beer! When you think of a sausage, your first thought is a simple meat and bun combination. However, there’s no reason why the dish can’t have a bit of elegance to it, and Stubborn Goat accomplished just that with their entry for this year’s Sausage Fest. A brisket chorizo sausage, which was spiced perfectly, sitting inside a sliced piece of baguette is the base for this dish. On top there was a combination of chimichurri, pickled onions, manchego cheese, and a HUGE pile of onion frites. I loved the manchego cheese, and the crunch from the onion frites gave a very satisfying texture to each bite. The one negative I found about this dish was that it was pretty difficult to eat as you couldn’t really pick it up with your hands because the baguette would split, and cutting it was tricky due to the tough exterior of the bread. That one point aside, this was a really delicious sausage, and it is one that I would gladly attempt to eat again! The guys at Krave have always known how to speak my language and it was no different when it came to their entry for this years Sausage Fest. Dubbed the ‘Bacon Double Cheeseburger Sausage’, this sausage was made for all the burger lovers out there! The sausage itself was made from both beef and bacon, from Getaway Farm, and was braised in Krave’s own Krave lager. The sausage was then piled high with all your favourite burger toppings, including cheddar, shoulder bacon, onions, pickles, and the always tasty Krave sauce. I may be a bit biased when it comes to this one, but this was one awesome sausage!